From June 2nd through June 4th the National Grange will be holding its Annual Legislative Fly-In in Washington, D.C. National Grange offers a scholarship, that youth members can apply for, which covers most of the expenses for the youth member to attend the Fly-In. Victor Salazar from Eureka Grange has been selected as one of the winners of this scholarship this year and will be joining us at the Fly-In. Victor just graduated from Clemson University in May where he studied Agricultural Education with a focus in Leadership Development and a minor in Political Science. On his Facebook page Victor announced that he is headed to Texas A&M this fall to pursue his Master’s Degree in Agricultural Communications. Congratulations Victor on both winning the scholarship and graduating from Clemson. Best wishes in your future endeavors. The Connecticut legislative session is in its final days and hopefully a budget has been presented by this point. The state budget is also affected by the federal budget. The biggest problem with the state budget is that the state is expecting to see cuts in federal monies but at this time they do not know how much. As you saw in last month’s column by Russell Gray, the lack of budgets put a hardship on towns who are trying to put together their own budgets for the year. One area of the budget that we are watching was the proposed reallocation of a portion of the Community Investment ACT (CIA) monies. It has been recommended that some of these funds be used for nutrition programs for schools which traditionally came from the general funds. We understand that the funding has been restored in the general funds for the nutrition program so CIA funds would not be touched. Some of these funds are used for the farmland preservation program. We also realize that until the final budget is voted on, nothing is definite and things can change. 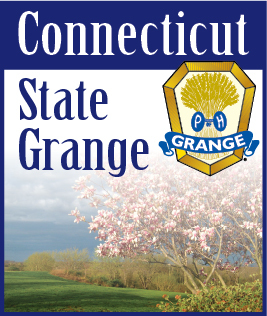 Has your Grange started working on your resolutions yet for the next State Grange Session? Many Granges and Pomonas limit their meetings during the summer months. Remember that resolutions should be sent from your local Granges to the Pomonas before being sent to State. A plus of this requirement is that it allows resolutions to be considered by a larger audience and educate others as to what the resolution is about. There is an outline that you can follow on the State Grange website as to how to write a resolution. Look under the Download section and select Legislative under Select Category. Feel free to contact any member of the Legislative Committee for help as well.